It's hard not to oooo and ahhh at cute little Wicket, huh? 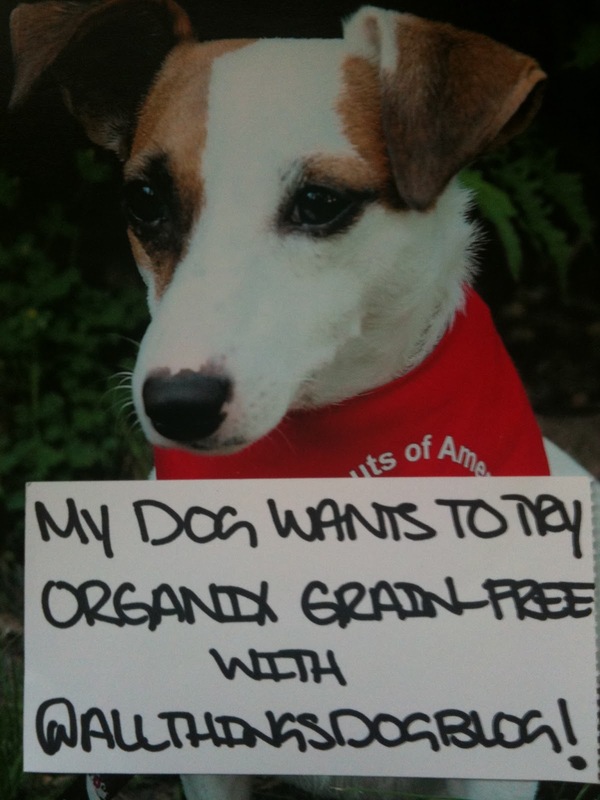 I'm sure the folks at Castor and Pollux Pet, who make Organix Grain Free food were happy to see some of the cute photos you guys submitted. I know a few of you are still figuring out how to harness technology to create these images, and I appreciate your challenges. 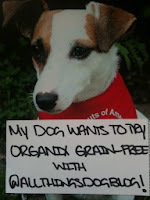 I have to say I've been really proud--just beaming--about your open-mindedness about trying grain-free food for your dogs. When I started the challenge, I wasn't sure how many of you would take me up on it. After all, no grains may seem odd to some of us. Imagine life without bread! 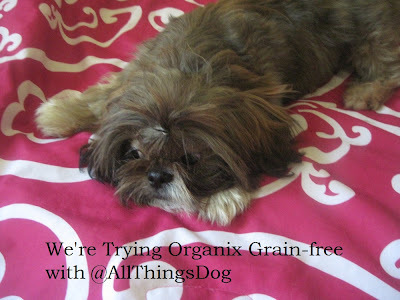 A lot of you seemed to realize that dogs did not evolve eating grain. It was added to their manufactured diet as a form of calories for energy, and a few other factors that probably are less important than the fact that Organix is predominantly made of organic ingredients. 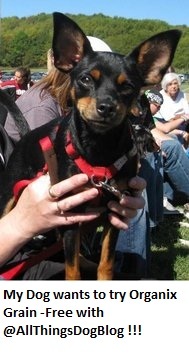 Speaking of calories for energy, did you notice the difference in how much your dog needs to eat? Compare the Feeding Guidelines on the back and side of the bag to those on the original Organix and you'll find that Grain-free Organix requires less food to provide the necessary calories and nutrients for good health. I suppose that explains the more compact deposits in my yard. What about you? Lola and Hunter Working It! If you miss out on this giveaway, watch for another coming later next month. 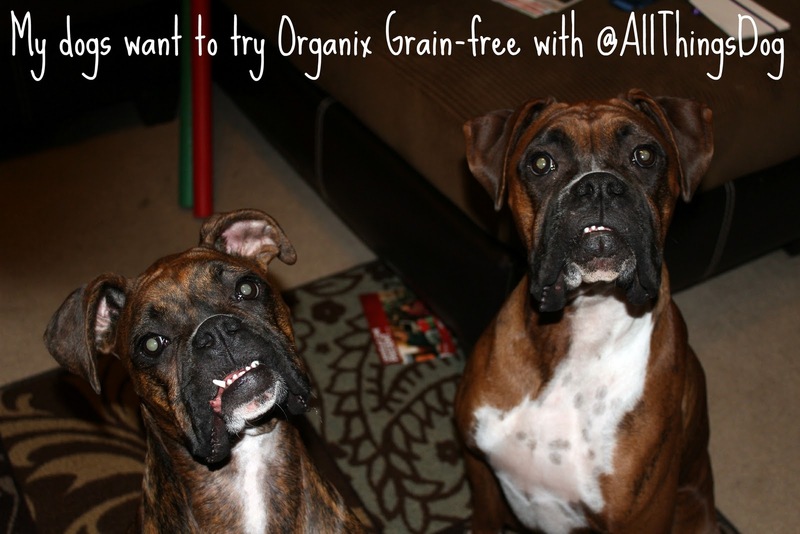 I'd like to give more of you an opportunity to take the Grain-free challenge. If you visit our giveaway post that lead to this winners' announcement, you'll see that the comments are all quite positive--great results and seamless transitions. Grain-free seems to agree with these owner's dogs, and I can say the same for Tanner and Oliver. Today's winners are: Tia S., Amy O., Misty W., Shiloh, Shelley P., Nancy W., Cheryl F, Rita S, Katie M, Claudia M, Rick W, and Colleen R. Watch your email for my notification, to be received from AllThingsDogBlog@gmail.com. If you don't see it by Sunday afternoon, please write to me with your address for mailing. NOTE: The coupons to be sent out have an expiration date of February 15, 2012. You'll need to identify your closest supplier quickly and be ready to pick up your food promptly. Finally, always follow the transition instructions for a new food, detailed at Castor and Pollux's site here. Best wishes to all of you and thanks for following All Things Dog Blog. Full disclosure: There was no purchase necessary to win in this giveaway. I was provided coupons for free bags of Organix as a promotional courtesy, and was not compensated to give them away. Watch for more giveaways coming soon.